Reg Tanna Park is just on the outskirts of Gladstone. I was going to the Botanic Gardens but they were having some sort of wanky ecofest so I got out of there quick smart. There was not much there but the birds were used to humans and allowed me to get real close to them and get some interesting shots. I did not even know these wetlands were here. I just wanted to find a camp and the St Lawrence Wetlands were just behind the camp. I had no idea. I like it when I find really good things by accident. 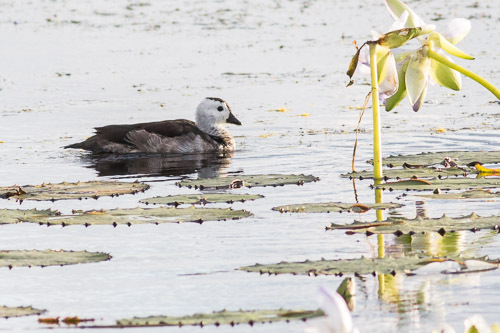 And some more Cotton Pygmy-goose. 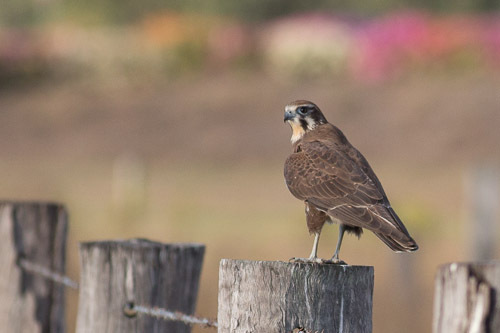 They are more widespread than I thought since I first saw them at Mareeba Wetlands. 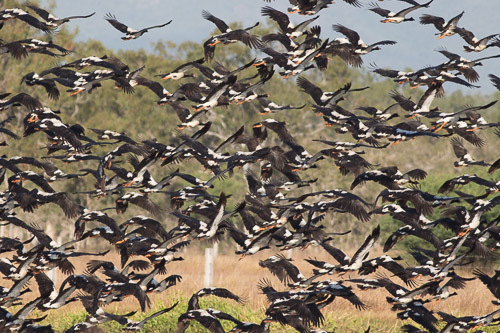 There were thousands and thousands of Magpie Geese roosting in the billabongs. They made the worst racket at night time. I cannot stop taking photos of these beautiful birds. I have not seen these gorgeous birds for ages. 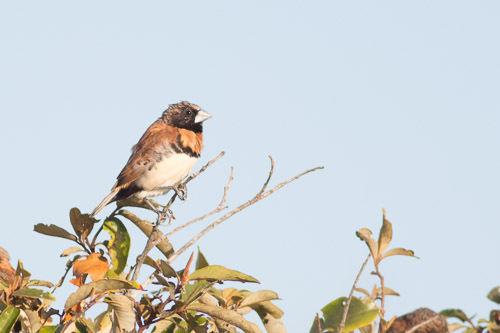 And finally I have seen the Chestnut-breasted Mannikin. I have been looking for these since Ingham. 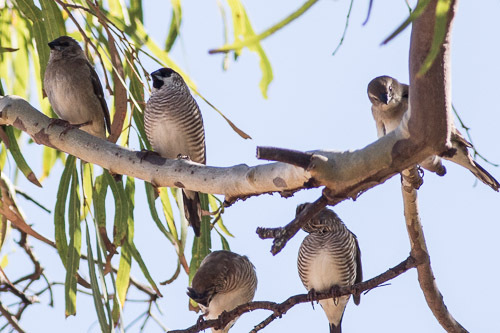 There were Double-barred Finches around as well which look a little bit similar, but not heaps the same. doh! I stopped at Carmila Beach for a quick look but did not find much. There was a creek flowing into the beach. 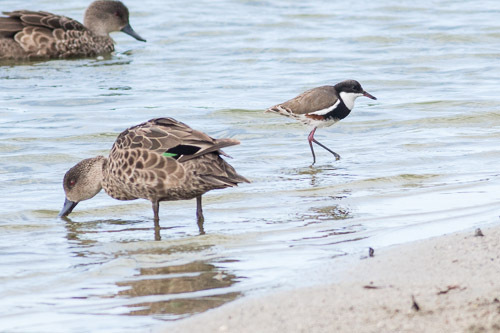 Just a couple of Red-capped Plover and a Bar-tailed Godwit. I think it might be better for fishing here. Up the road at Clairview was a bit better. 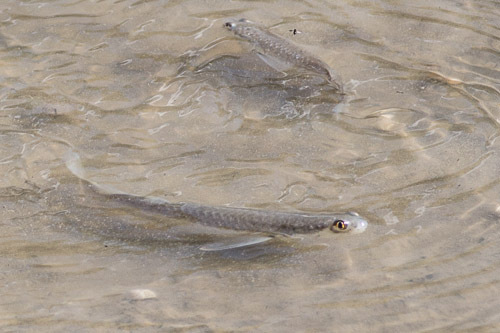 I saw these weird little fishes at the head of the creek where it flowed into the ocean. I have no idea what they are. Maybe poddy mullet. 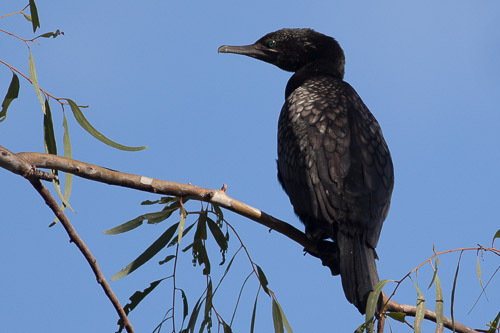 There were a few more birds at Clairview around the mangroves and beach shrubbery. 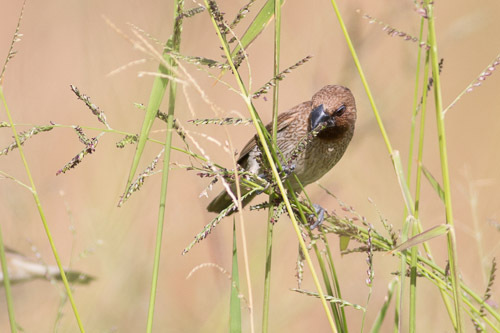 Quite a big mob of these Plum-headed Finch. 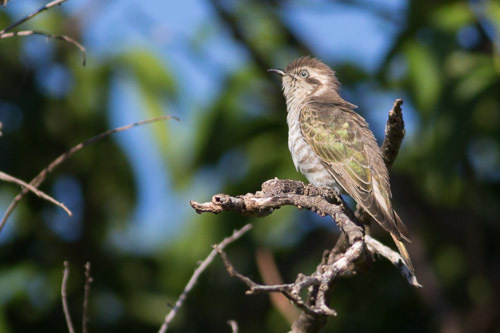 This Little Bronze-cuckoo was indeed very little. 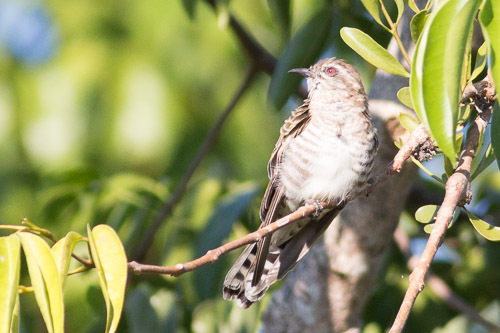 A lot smaller than the other cuckoos. 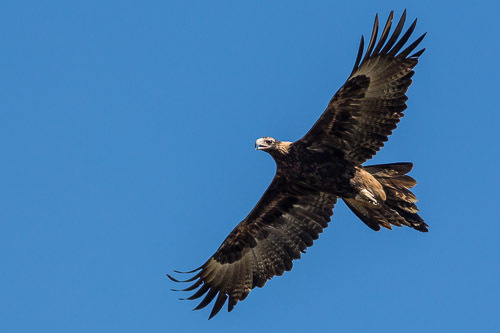 Back on the Bruce Highway, I screeched over to the side of the road whilst this pair of Wedge-tailed Eagles cavorted overhead. Then on to St Lawrence, which is an entirely different story…. These are my random tourist snaps from the point and shoot camera. I keep forgetting to process them so here they are all higgledy-piggledy. 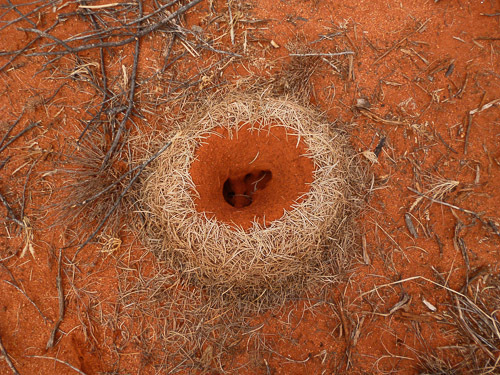 First up is an ant’s nest from around the border of South Australia and the Northern Territory. They have all these furry things around them that look really weird. 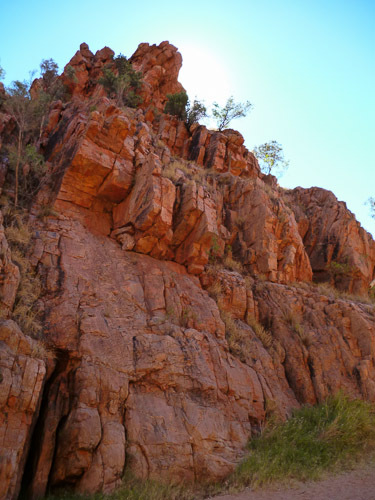 This is Emily Gap from the East Macdonnel Ranges, just near Alice Springs. There was one little puddle of water in the gap but I think most of the water flows underground. 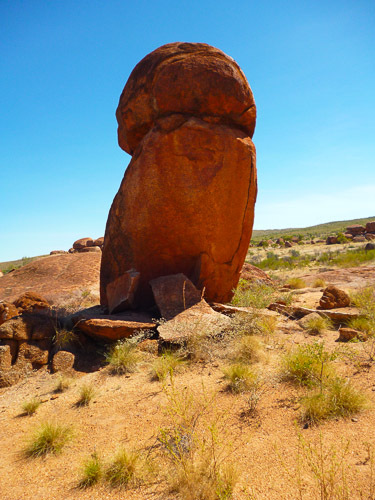 Further north in the territory, near Three Ways, is the Devil’s Marbles. And here is a panorama shot of the Devil’s Marbles. The country all through the center is very dry and there has been no water for a long time. 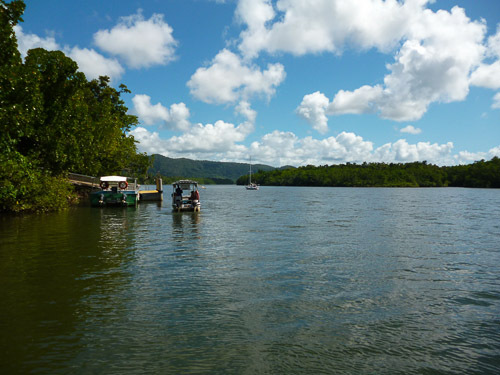 You can go on a cruise at the Daintree River to see a crocodile. The tide was all wrong when I was there so I gave it a miss. Daintree village is a very nice little place. Muller’s Lagoon is right in the center of Bowen, right next to the Woolworth’s shopping center. 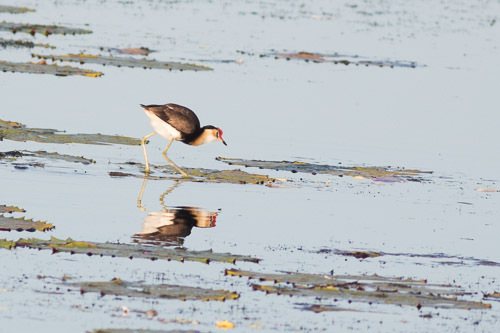 For a newcomer to Australia it would probably be a great place to see a lot of Australian water-birds. 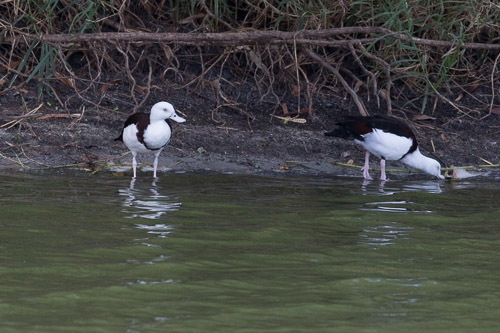 I did not seen anything except maybe a Radjah Shelduck but I cannot remember if I have seen one of these or not. A pair of Hardhead. 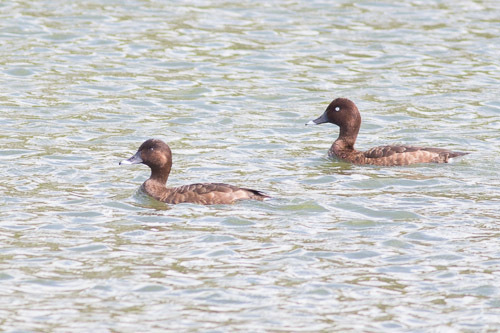 Also called White-eyed Duck for obvious reasons. 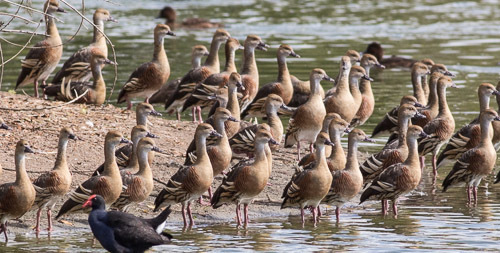 I was quite surprised to see lots of Plumed Whistling-ducks. I have not seen one of these for a while. And a shot of the Nutmeg Mannikin with some decent light. I missed out on seeing a crocodile off the beach of Cardwell this morning. I rocked up at the tourist information center and then went for a look at the wharf and some guy told me there was a crocodile crusising along the beach. I was a bit skeptical at first but a few others said they saw it too. I was talking to a local aboriginal man and he said that the croc regularly cruises along the beach and that he eats turtles! 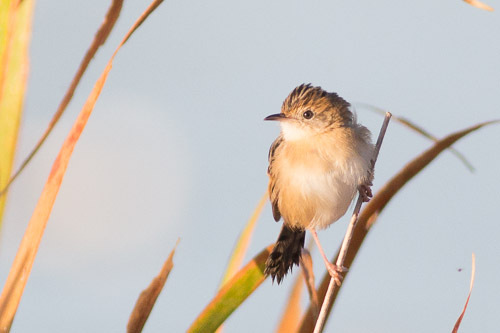 This is from the the afternoon session at Tyto Wetlands. I forgot to add it to the other lot. doh! 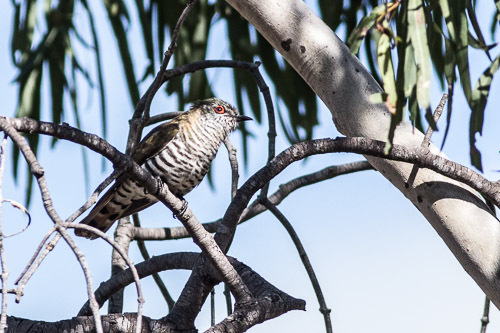 A tick for the Nutmeg Mannikin. 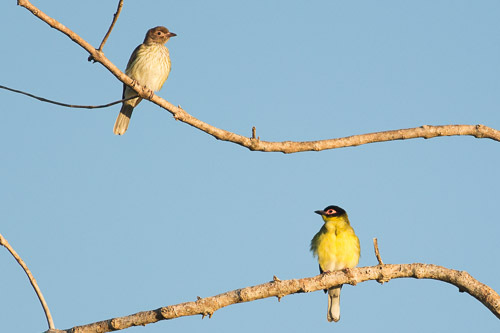 I was quite surprised to see the Olive-backed Sunbird here at Ayr. 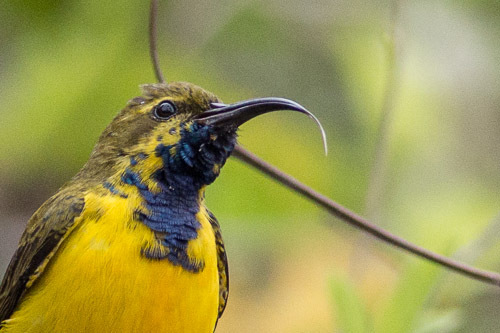 I had seen this bird in South-east Asia before and I knew that we had only one sunbird. 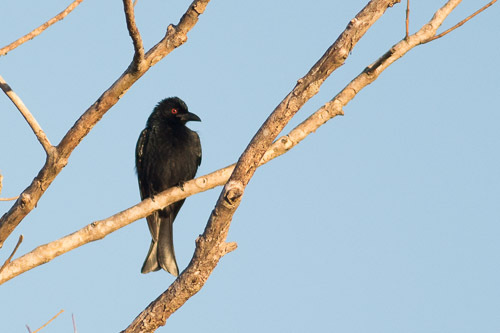 But maybe I had not seen a male before with its black chin and bright yellow colors. 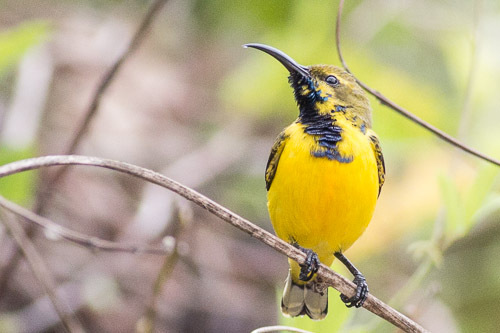 Also called Yellow-bellied Sunbird. I think he is sticking out his tongue here! I guess it is for sucking up nectar from the flowers. 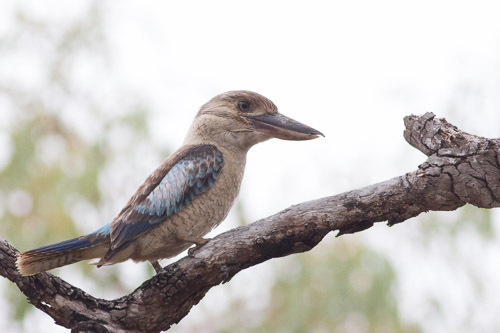 Here is a reasonable shot of a Blue-winged Kookaburra, mainly because other ones have been a bit dark. I walked across the Burdekin River bridge but there was not much below. 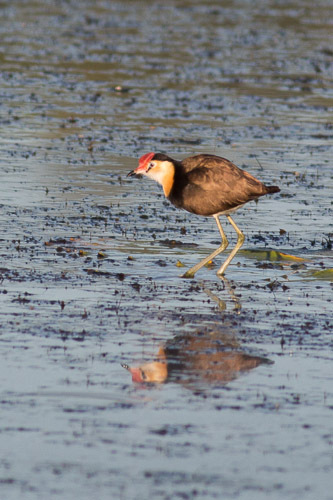 Just a heap of Pacific Black Ducks and a few Comb-crested Jacana. 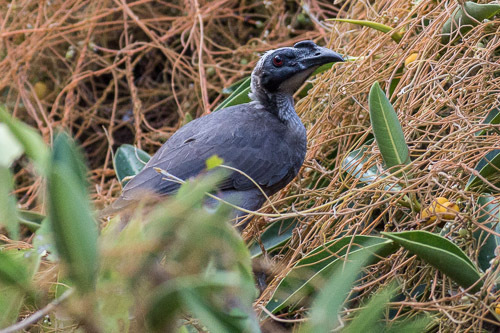 Arriving in Bowen, I went to Cape Edgecumbe, hoping to see some boobys or frigatebirds but all I got was this great shot showing the big schnoz of the Helmeted Friarbird. Later, I am going to Muller’s Lagoon for a look. Well here I am back in Ingham and digging around in the Tyto Wetlands. I love the place. 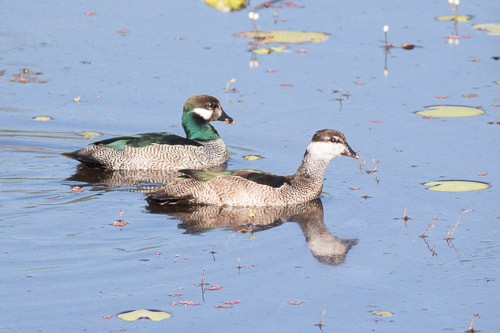 I saw some Green Pygmy-goose this afternoon. I did not see them last time. And I saw some mannikins I think. Not sure exactly what they are until I have a good look at them. 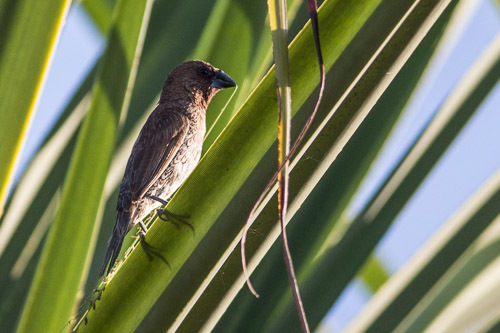 Nutmeg Mannikin. 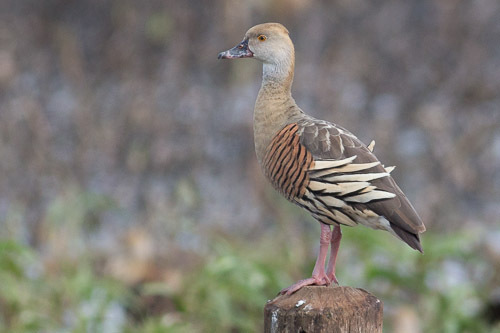 And Cotton Pygmy-goose. Amazing! This morning I got up early before sunrise and even did not have breakfast or a cup of coffee! And it was cold and wet grass. At least when the sun came up I got some good light unlike the last time I was here with overcast skies and bad bad light. 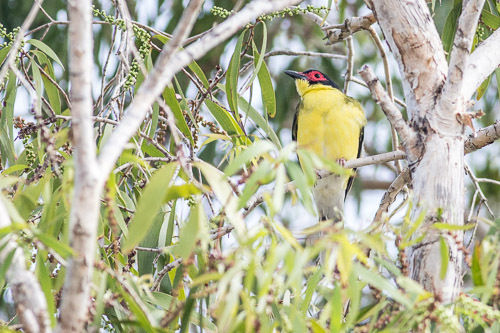 This is the northern “Yellow Figbird”, the flaviventris race of the Australasian Figbird. They have a very yellow front. 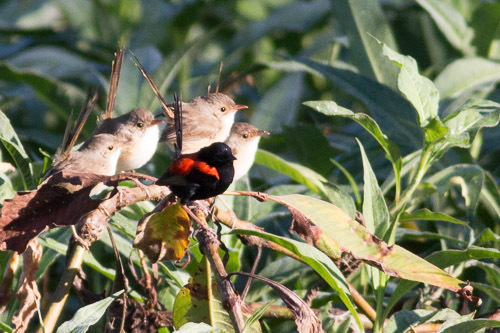 This Red-backed Fairy-wren mob were huddled up against the cold. brrr. 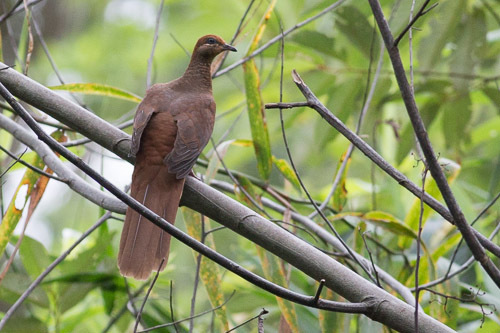 The Horsfield’s Bronze-cuckoo has a rufous edge along the tail feathers. And the bars on the chest do not go all the way across. Not sure why one has a red eye and the other a white eye? This is the male and female in good light. Abattoir Swamp is between Mount Molloy and Julatten on the Atherton Tablelands in Far Northern Queensland. I stumbled upon it by accident. I was just driving past and I saw the sign and said to myself “Hey, didn’t I read something about this place?”. So I stopped and walked to the hide which was closed and in disrepair, so I morosely trudged back and heard a few birds feeding in the eucalpyt buds and they just kept coming on and on. Finally I ended up with four new birds. This place is extraordinary. 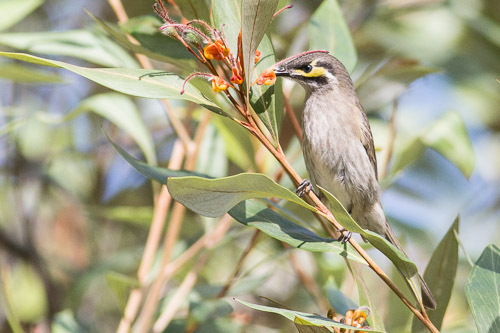 There are honeyeater everywhere. 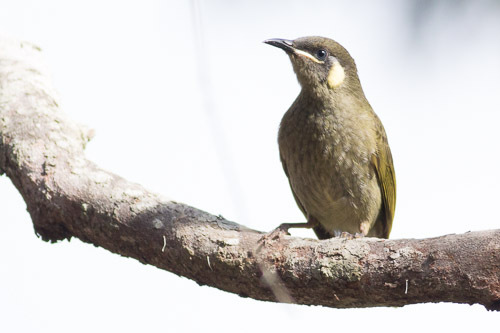 I think I counted about seven different species of honeyeaters. Amazing. 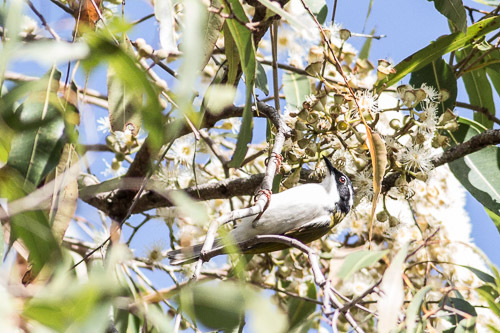 The only difference from the White-naped Honeyeater is that the black from the head extends under the bill on the White-naped Honeyeater. 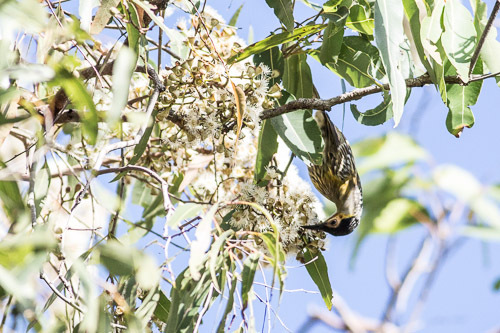 I thought this was a Regent Honeyeater at first but after a good look concluded what it was. 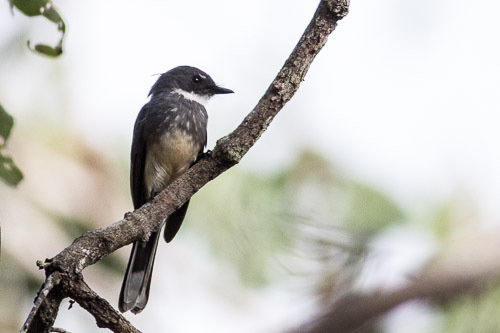 This is a very localised bird and endemic to this area. 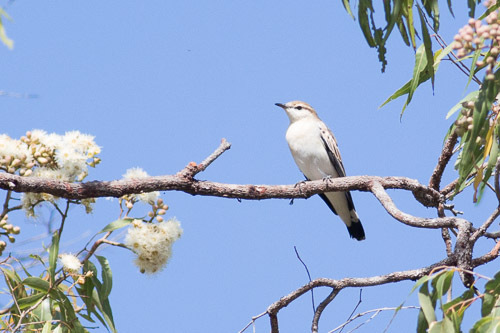 These are heaps common down south all the way along the coast. 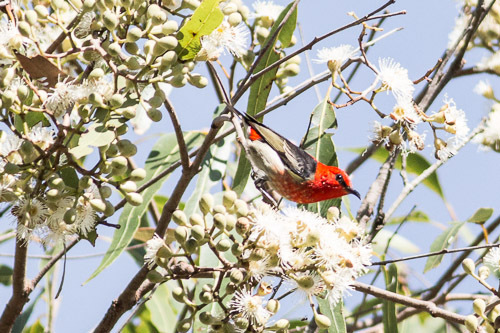 The Scarlet Honeyeater is one of the most beautiful birds evah! 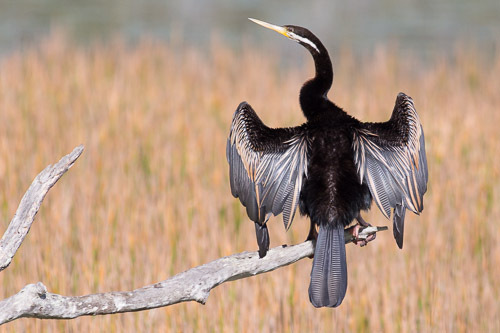 The Mareeba Wetlands is about ten kilometers north of Mareeba. Well worth a visit if only for the both species of Pygmy-goose that they have here. I went for a walk around the lagoon, then headed inland past the wash section of the pandanus trail and up the hill. This seemed to be a better area than around the lagoon. After the walk, I went for a boat ride on the lagoon. 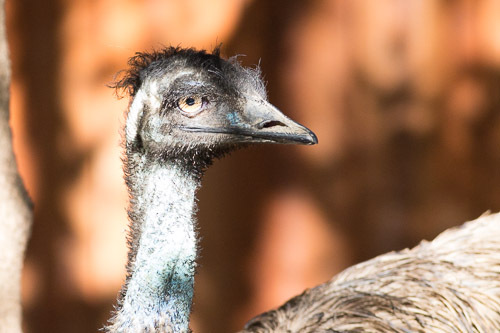 It is only $15, so well worth it to get up close to the birds. The boat has an electric motor, so it is very quiet. 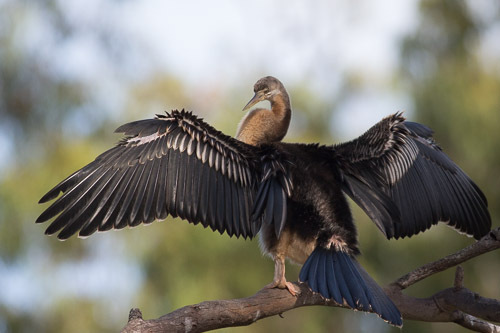 This Darter drying its wings had the most amazing colours. 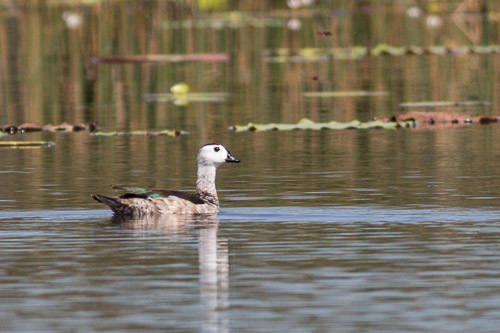 The Cotton Pygmy-goose is relatively rare from what the guide at the wetlands tells me. Something like about a thousand pairs of birds. 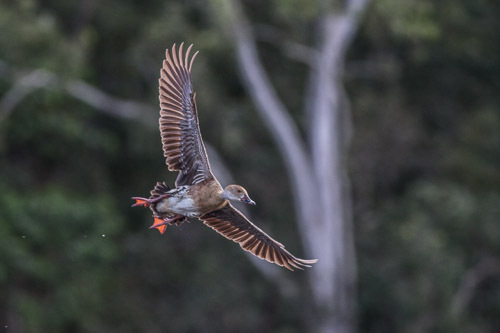 Recently about half a dozen have been coming to the Mareeba Wetlands, so that is a good sign. 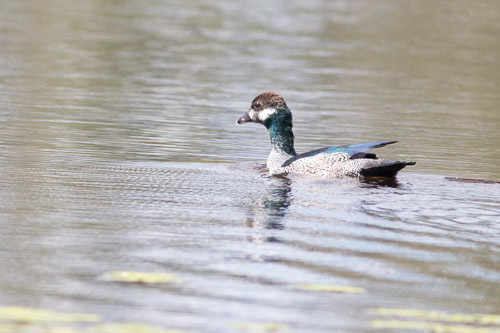 The Green Pygmy-goose is very different from the Cotton Pygmy-goose. 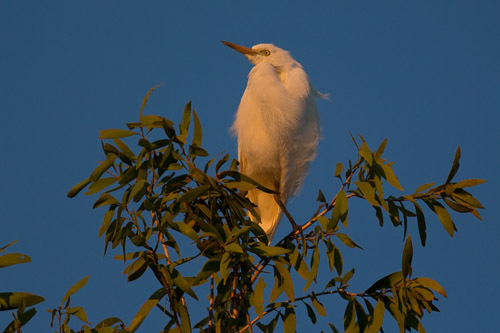 It has a green patch at the back of the neck and very scalloped body plumage, unlike the cotton which has a mostly white body. But both ducks are only seen in the far north of Australia. 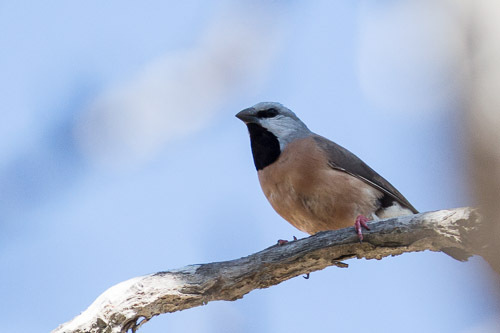 A pair of Black-throated Finch were hanging around very quietly at the wash section of the pandanus trail. They were hiding amongst the leaves in their tree and not making much noise at all. I was lucky to see them on the way back from my walk. I started off towards Mission Beach looking for a Cassowary, but no dice. I stopped at Licuala picnic area , Djiru National Park and went for a walk along the track. The weather was appalling. Overcast and raining. 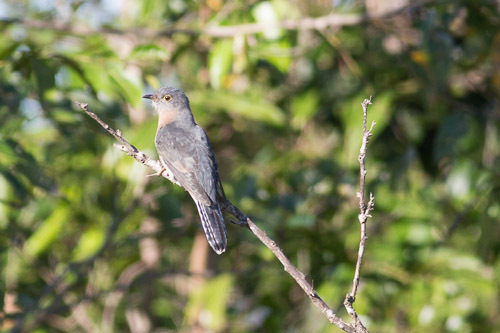 I saw nothing except and Brown Cuckoo-dove and a Leaden Flycatcher. After lunch at Malanda, I turned off to the Bromfield Swamp and thought I had seen a Sarus Crane but it turned out to be a Jabiru. 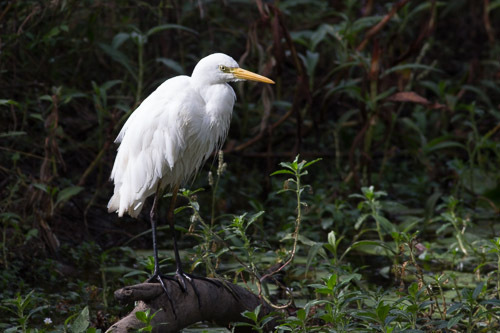 🙁 Discouraged, I headed for the Nyleta Wetland – Hasties Swamp National Park. 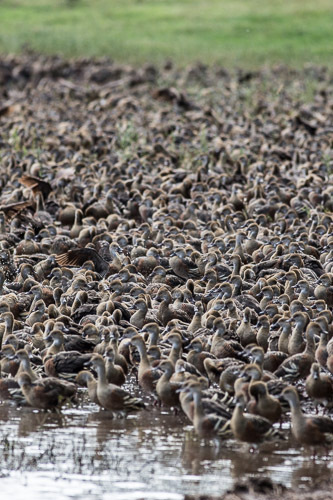 And lo and behold there were thousands and billions of Plumed Whistling-ducks. tick! This one obliged my by standing on a post and posing classically. And this is one in flight. Nice.